Please note: This page is updated on an ongoing basis, so all entries below should be read in the past tense. 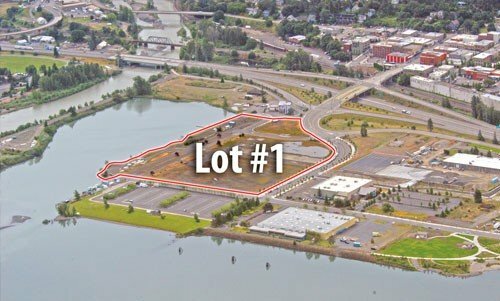 The Port of Hood River is finalizing a development concept for the large, undeveloped land parcel on the waterfront known as Lot 1. It is the largest remaining development site on the Hood River waterfront and is zoned Light Industrial. The Port will host a public open house special meeting focused on Lot 1 development in the Port conference room, located at 1000 E. Port Marina Drive in Hood River on Tuesday, September 15 beginning at 5:30 p.m. 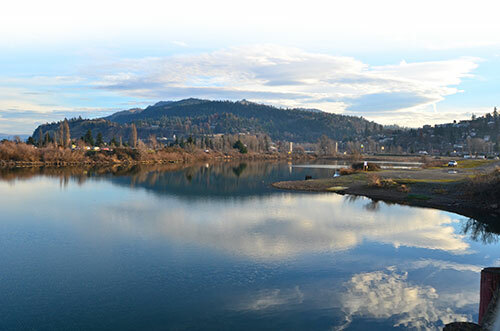 In December of 2014, the City of Hood River adopted the Waterfront Refinement Plan, following a legislative process to address zoning and design standards on undeveloped areas of the waterfront. That plan informs the current development concept and provides clear parameters for potential building types, sizes, and allowed uses. The public open house special meeting will feature a presentation by landscape architecture planning firm Walker|Macy who will provide an overview of the project, key issues, and objectives. The public will be invited to provide comment during the event. Written comments may also be submitted by mail to Port of Hood River, 1000 E. Port Marina Drive, Hood River, OR 97031 or via email to porthr@gorge.net. For questions regarding the Open House Special Meeting event, contact the Port of Hood River at (541) 386-1645 or via email to porthr@gorge.net. The Port of Hood River Commission will host a public meeting on the Nichols Basin West Edge Trail planning to review and discuss 25% construction plans developed by Walker/Macy (a PDF of these plans is available here). The meeting will be held at the Port of Hood River conference room, located at 1000 E. Port Marina Drive in Hood River. This public meeting on the project follows four earlier public meetings, which focused on trail design. Input, consensus and Port Commission approval will allow Walker/Macy to move forward with 60% construction documents. The Port of Hood River Commission has developed a public process and meeting schedule in preparation for the design and planning of Nichols Basin West Edge Trail that will include a pedestrian/bicycle path, water access, and landscaping. The work will be guided by a Project Advisory Committee, and include four public meetings to obtain community input. The first public meeting scheduled for Tuesday, January 28 at 5:30 p.m. at the Port of Hood River conference room This “Project Initiation” meeting will cover an overview of the project, key issues, project objectives, and public comments. The second Nichols Basin West West Edge Trail public meeting “Initial Alternatives” will be held on February 13. The advisory committee and members of the public will review and discuss initial concepts prepared by Port of Hood River consultant Walker/Macy, a landscape architecture planning firm. Public comment is welcome. In March, the Port Commission seeks to refine the project, and will present two design alternatives for Nichols Basin West Edge Trail at a public meeting on March 11. Public and advisory committee input will be sought and considered for a preferred concept. Public comment is welcome. In April, the Port Commission will host a final project public meeting on April 8 to review refinements to the preferred plan. Public comment is welcome. All meetings will begin at 5:30pm at the Port conference room at 1000 E. Port Marina Drive in Hood River. In addition to public testimony at the above-mentioned meetings, written input may be submitted by mail, email (porthr@gorge.net), or through the link below. Project progress and updates will be posted on this web page, as well as any changes to the schedule of the Nichols Basin West Edge Trail planning effort. Lot #1 is a seven-acre parcel west of Nichols Basin, and south of the Hood River Event Site. It is one of the largest remaining light industrial properties in the City of Hood River. It is also a highly visible parcel that many describe as the “front door” to the Hood River waterfront. Group Mackenzie, working with Port staff, has prepared this Lot 1 Preliminary Concept Plan to guide future development. This Concept Plan has been prepared as part of the implementation of the 2007 Hood River Waterfront Development Strategy. The action items in the development strategy called for exploring the market potential and identifying a development concept for Lot 1 that would position the property for future developments. This Concept Plan was prepared between January and December of 2012 and includes evaluation and documentation of existing conditions on the site including utilities, easements, rights of way and elevations; preparation of a market analysis of light industrial market conditions, opportunities and constraints; identification of development objectives and issues; preparation of concept alternatives; finalization of concepts and preliminary cost estimates; identification of implementation issues; and public outreach and input. The concept plan includes both the upland portions of Lot 1 and the portion of the site adjacent to Nichols Basin. The plan was developed with input from the Port Commission at four public Commission meetings, one separate public meeting and two Technical Advisory Meetings specific to the Nichols Basin trail and park element. Additional technical input was provided by E.D. Hovee and Company, who prepared market research, assessment and interviews with local businesses; and from Project Ecological Development, a Portland-based development firm familiar with development in the Hood River Area. More. The information in this notebook was prepared and compiled to support the Master Planning efforts for “Lot 1” (Study Area). It contains a summary of the existing conditions and site features that may affect the planning and development of the Study Area. The supporting maps and drawings were obtained from publically available sources and discussions with the various utility providers. There were no on-site investigations or specific studies accomplished with this work. The Study Area generally includes land to the east of North Second Street between Riverside Drive and Portway Avenue and west of the boat basin in Hood River, Oregon. The area is owned by the Port of Hood River and is currently vacant. Several key technical issues are identified that may affect development within the Study Area. Section Eight of this report goes into greater il on these issues, each of which may require further study or action depending on the final development plan selected. More. The Port of Hood River will hold its first public meeting on planning for a major light industrial property at Waterfront Business Park, known as Lot #1. The meeting is scheduled for Wednesday, May 16 at 6:00 p.m. at the Port Commission Meeting Room at the Port of Hood River office. More. The May 16, 2012 Presentation is available here. A significant amount of information has already been prepared about the Nichols. The list of links below represents most of the information that the Port has received to date.